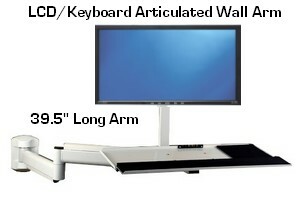 Create a wall-mounted computer station with this extra long and heavy-duty LCD/Keyboard articulated wall arm. A good solution for using a computer in bed by mounting the arm on a side wall or on the headboard wall. This heavy-duty steel arm will extend from 5.5" up to 39.5" from the base. The middle "elbow" articulation will allow for many operating angles. Note that the arm is not height adjustable, so the ideal height must be selected when installing on the wall. The keyboard tray includes a mouse pad and has a slight tilt adjustment. This keyboard-LCD combo arm extends and swivels 90 degrees to each sid. The keyboard tray also swivels. The LCD monitor mount is VESA 75x75 and 100x100 compatible, and it tilts, swivels and rotates.